As promised, I’m announcing my finalist today. Typically picking a finalist is kind of a weird thing. Art is subjective, and it very much depends on who is interpreting the work and how their personal perspective is bent that day/minute/era/whatever. I basically base my finalist decision off of one question: Which book can’t I stop thinking about? Whichever book is the answer to that question moves on to the next round. I’m saying that so maybe you’ll understand, with those facts laid out point-blank, how much this book had to grip me for it to stay with me the way it has. I’ve said a lot about it already. My review is here, if you want to read it. If you want to check out it’s Amazon page, click here. I could say more, but instead, I’ll just announce my finalist. As I said above, I typically don’t read young adult, and I have almost no interest in dystopian settings, but despite both of those points, this book really got me going. I loved the more mature themes. I enjoyed the writing, but really it was the detailed worldbuilding that sealed the deal here. I’m a sucker for details, and Grigalinuas (I swear I will absolutely never spell that name correctly the first time I type it out) managed to weave them in subtly, but with maximum impact. The mixture of good writing, good editing, good worldbuilding, and characters that I might not have always liked but ended up growing on me over time, made this one a slam-dunk. 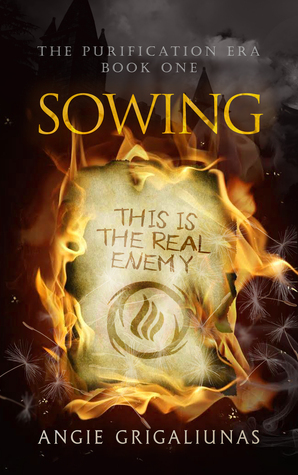 Sowing was basically everything I didn’t know I really love about young adult speculative fiction. Sowing reminded me why it’s a bad, stupid idea to ignore an entire age group of novels, or a subgenre. Congratulations, Angie Grigaliunas! Good luck in the final round!